We wait all year for summer in New England. Sometimes I think we'd eat anything if you give it to us on a patio with a couple of drinks. No, but we can report it's cooling off for evening forays to places we missed earlier. Here's the plan: we're sitting out until it snows. 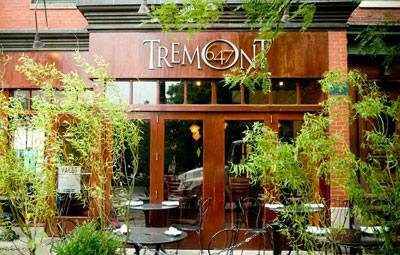 Tonight, we're on the patio at Tremont 647 with 20 other lucky people and it doesn't get much better than this. In another lifetime, I met owner Andy Husbands when he was putting together his hip New American space in 1996. And here he is, still holding the corner at West Brookline Street to the good fortune of his South End neighbors. It's prime for food and for people watching. You have your usual Tremont characters thankfully hanging several doors down, dogs, a smooching couple, baseball caps, shorts on people who were never meant to wear them, more dogs and a ton of guys having a good ole time at the bar. I wish I could drink. When I walk back to see the grill, there's not a plate of anything resembling food on the bar, just glasses. Eat something already. Lan and I open with Pimms cocktails. Our starters are two ice cold lobster tacos, the crispy shell kind and they're a special - sitting on a tiny mustard green salad - all for five bucks. (They do taco Tuesdays featuring six styles, of which this is not one, and more about this later.) Our next appetizer: Korean beef dumplings that we're slow to define since, aha, they're not pork and that's better than okay. They're juicy and big enough to cut in half. Onion bread comes with hummus that's been blended with maybe cumin? One of us thinks that's fine and the other, not so much. I miss salted butter, people. At this point, the serious eater can't wait for her dinner. Pan seared scallops arrive armored in coconut and lime, plated on cool red quinoa salad laced with lime zest dressing. This is scallop season all right and they're perfect. It's so hard getting them right at home - how do they do it here? It must be those cast iron frying pans piled up by the grill. The chef catches me looking and asks if I've come to see what all the noise is about. No, we have plenty going on up front too. The purist's order is tofu tacos. I had them at another South End place and I'm curious. 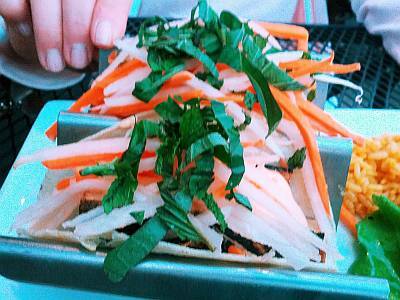 These are similar but not matching: rich grilled tofu with sriracha aioli, carrots, maybe zucchini or jicama, and crunchy greens slivered on top. For a girl who left Long Island never having seen a taco, I ate them exclusively freshman year at Tucson's University of Arizona; yes, yes, the five. (I checked - they're still at it with crisp Mexican tacos in the Taco Shop.) I never got over the crunchy, beefy, cheesey, salsa-filled U of A style until some East Coast chef opted for soft tacos and voilà. Soft tacos with tofu: thanks to world cooking, sriracha's our favorite extra. Even better, these are loaded in a taco holder so they stand up until they're demolished and only a little is falling out. We eat a lot, so much so that when one of our many smart servers comes back with the dessert menu, well, we can't even look. I looked now though. We missed strawberry shortcake, strawberry tart, banana cream pie, piña colada cupcake, and chocolate almond bacon bark, health foods all so we're going back. Tremont 647 and Sister Sorel, its sibling next door, host wine dinners for Share Our Strength's Cooking Matters and Operation Frontline. On Taco Tuesdays, it's south of the border booze and appetizers with tacos, two buck mix 'em ups. Weekends there's pajama brunch every Sunday. I haven't been but I'm pretty sure it's the staff in pajamas although I'm sure it's okay if you're casual too.